to the world that you are a crazy cat lover and it will do it with style. This is such a cool item that you may want to go car shopping just to make sure you have a vehicle with a rear windshield wiper just to have something to put under it. Two cats and four tails are included in the kit. The kitty is so easy to install. Just clean the window, stick on the cat, smooth out the bubbles, and go. The next time it rains your new kitty can have an opinion about that! 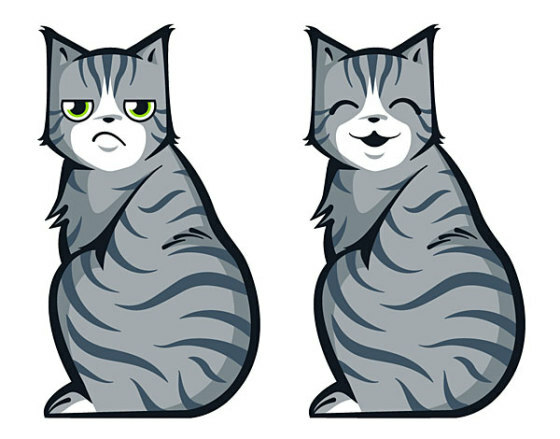 You can choose between a happy cat and a grumpy cat. I'm thinking the grumpy one would help would be tail-gaters to back off! 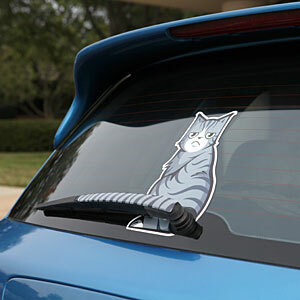 The Moving Tail Kitty Car Decal was invented by the thinking geeks at ThinkGeek.